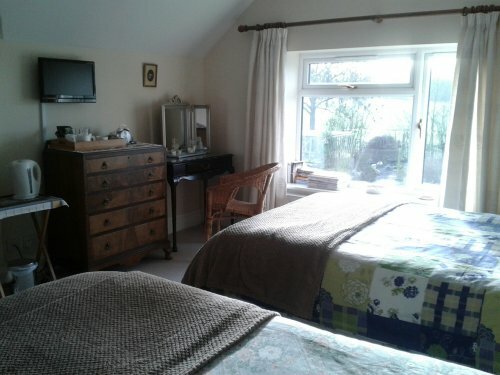 The accommodation at Lodge Farm comprises, a double room with en-suite shower room, a family room with double and single beds, a double room and a single room, all served by a family bath/shower room. An additional bath/shower room can be made available during full occupancy. All rooms have TV’s, free Wi-Fi and Tea and Coffee making facilities. The rooms are all south facing and overlook the garden. Breakfast is served in the dining room or on the patio in summer. Guest may also take breakfast in the farmhouse kitchen if they wish. There are excellent pubs in the neighbouring villages offering home cooked food and real ales. There are a variety of take-aways in Dunchurch (2 miles). On the first Thursday of each month there is a Farmers Market in Grandborough (2 miles). The price of your room includes Full English Breakfast, a lighter breakfast is also available. All our ingredients are locally sourced and homemade where possible and eggs are from our own chickens and ducks. Wherever possible we cater for individual dietary requirements.